I'm assembling an army...an army of arm candy. 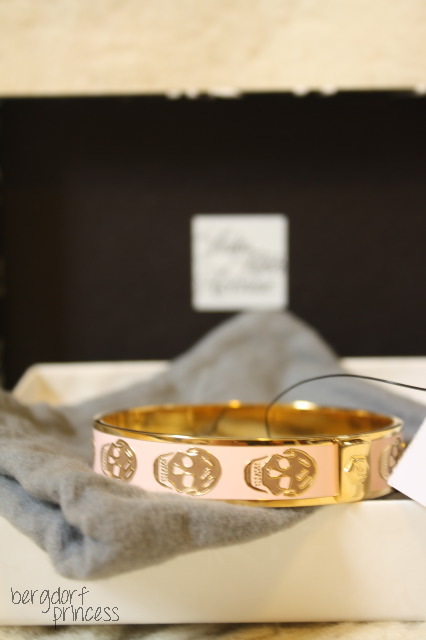 The first weapon in my arsenal is this Alexander McQueen enamel skull bangle. Tough but feminine, this delicate bangle is the perfect first recruit for my Arm Candy project. The juxtaposition of the light pink with skulls can be considered a metaphor for the duality that can be found in all aspects of life. I'm aware of the fact that I'm talking about a bracelet, but so much of life is about contradictory elements coming together to create something imperfectly beautiful. It's not always duality - many it's more than two elements coming together. The concept of contrasting things entwining is very interesting, and it always translates well into fashion. I like to mix the hard and the soft - leather and lace, structure and lack thereof - as well as different textures, fabrics, colors. There is something about taking things that are different and putting them together that just, well, works. Project Arm Candy is far from over. There are a few other weapons I'm hoping to add to my armory, like the small 3D skull bangle, the thicket 3D skull bangle, the skull and claw bangle, and an Hermes Clic H bracelet. You can buy the bracelet in this post from Bergdorf Goodman or Saks. I got mine from Saks, but I think I got the last pink one, because after my order processed, it was gone from the site. :( However, the white and lilac one would've been my next pick! I'm also really liking Kate Spade bangles, such as this one. What a beautiful bracelet- i love it! My mum has Hermes Clic H bracelets in orange and white and they look great stacked together as 'arm candy'!!! I would also recommend Monica Vinader- her 'Fiji' and 'Rio' friendship bracelets are perfect for stacking and each colour has a different meaning which is really nice. Mulberry has some nice bangles such as the 'Tillie', and Eddie Bergo has some nice studded/spike designs. Juicy Couture have some really cute friendship bracelets at the moment too. I loveee this bracelet. Fabulous!! Wow! This is the best gift for any man. My husband gifted me a beautiful Tory Burch tote and in return, I also want to gift something precious to him. Please tell me cost of this item.